Oprah Winfrey rose out of hardship and incredible poverty to become one of the most recognized and well-respected people in the world. In The World According to Oprah, Ken Lawrence captures this amazing woman in her own words, as she expresses the ideas and beliefs that made her who she is today. Since her start at a tiny Nashville radio station, Oprah Winfrey has become a media mogul, founding a film and television production company, an inspirational magazine, and a $20 million public charity, and cofounding a cable network for women. Abused as a child, she has even helped to pass a law that protects children from abuse. 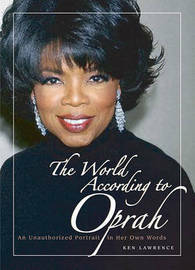 The World According to Oprah is a collection of quotes from this talented and multifaceted woman. * "My show is really a ministry--a ministry that doesn't ask for money. I can't tell you how many lives we've changed--or inspired to change." * "My father turned my life around by insisting I could be more than I was." * "Although I'm grateful for the blessings of wealth, it hasn't changed who I am. My feet are still on the ground. I'm just wearing better shoes." * "Real success comes when you learn to act as if everything depends on you, and pray as if everything depends on God. God can dream a bigger dream for you than you can ever dream for yourself." Ken Lawrence has covered the political and celebrity scene in Washington, D.C., for more than 20 years.